Women on the Land: It’s Electric! Curious about electric work? We all know electricity is not a hobby, but come out and learn the 101 of electric theory and what you can do as a homeowner, homesteader, or farmer! Each student will wire a light, a switch, or an outlet, and we will examine home electrical applications such as changing an outlet, making an extension cord, wiring heating sources for water, solar and grid-tied animal fencing, and running electric to remote access areas. Students will leave the course with basic skills and knowledge of electric work, and a reasonable understanding of what a layperson should and shouldn’t do themselves. 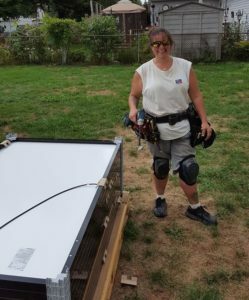 This workshop is taught by Rebekah Carpenter of Fingerlakes Renewables Solar Energy. We’ll break for lunch at 12pm. Please bring a bag lunch. The Women on the Land Series is a collection of hands-on workshops for women taught by women and include topics such as butchering, welding, carpentry, electric, and chainsaw skills. Gender non-conforming and trans folks welcome at these events. Registeration required. Space is limited. Please email info@groundswellcenter.org with questions or comments.